Money and debt are very scary subjects for most people. This course was developed to teach people how to take control of their financial future. The Rich Dad Company announced today the release of it’s new online course, How to Manage Your Money. Featuring best-selling author, Robert Kiyosaki, the course is based on the lessons of Robert’s rich dad. Unlike other courses that profess cutting up credit cards and living a life of scarcity, How to Manage Your Money teaches students how to use money as a tool. 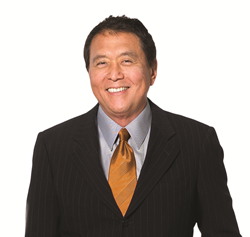 For almost twenty years, Robert Kiyosaki has dedicated his life to financial education. First with the board game, CASHFLOW 101, followed by the best-selling book Rich Dad Poor Dad, his latest venture takes aim at making personal finance simple to use and easy to put into action. “Money and debt are very scary subjects for most people. This course was developed to teach people how to take control of their financial future,” says Kiyosaki. The course consists of seven units that include videos, activities, quizzes and games to teach each lesson. It can be taken at the participant’s own pace. Upon completion, each student will have constructed a personalized plan for managing their money and laid the foundation for financial independence. The Rich Dad Company will be offering the course for purchase, on its website, now through March 6, 2016. Best known as the author of Rich Dad Poor Dad – the #1 personal finance book of all time – Robert Kiyosaki has changed and challenged the way the tens of millions of people around the world think about money. His book title holds four of the top ten spots on Nielsen Bookscan List's Lift-to-Date Sales from 2001-2008 alone. In addition, Robert has been featured on shows such as Larry King Live, Oprah, The Doctors, Bloomberg International Television and CNN. Visit http://www.richdad.com for more information.